Hold tight! Here comes the most perfect Flamenco dance show in Barcelona city that you may watch in your life. When it comes to Flamenco, Tablao Cordobes is the best beyond question. Dancers, atmosphere, the place and the staff are really meticulous. Dancers and singers make you feel that they have the common feeling. We recommend you make reservation if you have limited days in Barcelona but at the gate we guarantee that you will find a seat for Flamenco Dance Performance. There is open buffet if you like but you don't have to choose this option. You can only watch the performance or you can combine the dinner and show together. 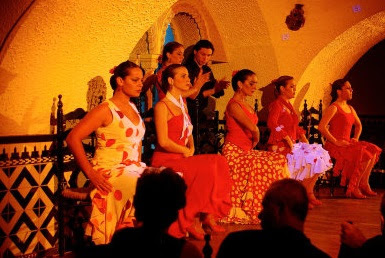 The Flamenco Dance show generally lasts one hour. Tablao Flamenco is at La Rambla so it's to easy to get. Tablo Flamenco Cordobes promises you taste the best music and dance show in Barcelona city. For a fascinating, magical and passionate night we highly suggest you see this astonishing place once during your trip. Sangria, delicious and various local food and alive Flamenco dance show. What can we say more? Go and get a seat to make the best of your trip in Barcelona city. We will be here with more posts to be able to make your journey much more enjoyable so please keep on following your Barcelona city guide. There are many things to do in Barcelona city and you will find everything at this site I hope you can enjoy the tour. Here there are map and a video. Please have a look at before you go. Thank you Abhinav Chadha for the video. Please contact us if you don't want us share the video.